On the 27th (Sat), contemplate in the serene atmosphere at Temple of the Emerald Buddha (Wat Phra Kaew), step into the grandiose world of The Grand Palace, then take in the spiritual surroundings of Wat Pho, and finally contemplate in the serene atmosphere at Wat Saket. On your second day here, look for all kinds of wild species at SEA LIFE Bangkok Ocean World, then contemplate in the serene atmosphere at Temple of the Golden Buddha (Wat Traimit), and then contemplate in the serene atmosphere at Temple of Dawn (Wat Arun). To find photos, other places to visit, maps, and more tourist information, read our Bangkok trip builder . Recife, Brazil to Bangkok is an approximately 29-hour flight. You can also do a combination of bus and flight. The time zone difference when traveling from Recife to Bangkok is 10 hours. When traveling from Recife in April, plan for somewhat warmer days and about the same nights in Bangkok: temperatures range from 41°C by day to 31°C at night. Cap off your sightseeing on the 28th (Sun) early enough to travel to Ko Pha Ngan. 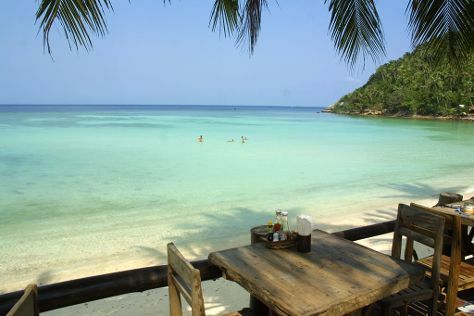 Ko Phangan vacations serve as an ideal escape for backpackers and other spontaneous travelers. On the 29th (Mon), see some colorful creatures with a scuba or snorkeling tour and then kick back and relax at Salad Beach. On the 30th (Tue), you'll have a packed day of sightseeing: kick back and relax at Ban Khai Beach and then kick back and relax at Haad Khom. To see maps, other places to visit, more things to do, and other tourist information, refer to the Ko Pha Ngan trip itinerary builder site . Traveling by combination of flight and bus from Bangkok to Ko Pha Ngan takes 5 hours. Alternatively, you can take a bus; or do a combination of train and ferry. Expect slightly colder weather when traveling from Bangkok in April: highs in Ko Pha Ngan hover around 38°C, while lows dip to 32°C. Wrap up your sightseeing on the 30th (Tue) to allow time to travel to Ko Phi Phi Don. Find your inner peace on Ko Phi Phi Don, the largest island in the eponymous archipelago. Kick off your visit on the 1st (Wed): stroll through Maya Bay and then discover the deep blue sea with a scuba or snorkeling tour. On the 2nd (Thu), you'll have a packed day of sightseeing: tour the pleasant surroundings at Long Beach, then enjoy the sand and surf at Nui Beach, and then kick back and relax at Laem Tong Bay. To find ratings, other places to visit, more things to do, and tourist information, read Ko Phi Phi Don trip itinerary builder site . Traveling by combination of bus, flight, and ferry from Ko Pha Ngan to Ko Phi Phi Don takes 7 hours. Alternatively, you can do a combination of bus, flight, and ferry; or do a combination of bus and ferry. Traveling from Ko Pha Ngan in May, plan for slightly colder nights in Ko Phi Phi Don, with lows around 28°C. Finish up your sightseeing early on the 2nd (Thu) so you can travel to Patong. Take advantage of nighttime entertainment and daytime relaxation on a Patong vacation. Start off your visit on the 3rd (Fri): identify plant and animal life at Wildlife Areas and then enjoy the sand and surf at Patong Beach. Keep things going the next day: enjoy the sand and surf at Gay Patong and then stroll through Freedom Beach. For traveler tips, ratings, maps, and more tourist information, read our Patong vacation builder app . Getting from Ko Phi Phi Don to Patong by combination of ferry and taxi takes about 1.5 hours. May in Patong sees daily highs of 38°C and lows of 28°C at night. 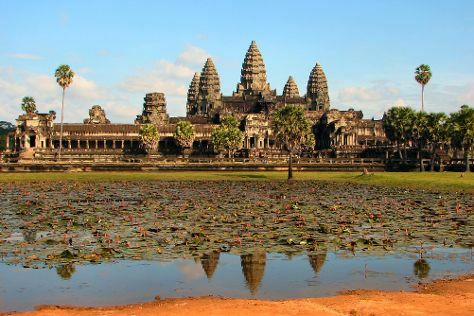 Cap off your sightseeing on the 4th (Sat) early enough to travel to Siem Reap. Once a small village in northwest Cambodia, Siem Reap now serves as a gateway to the Angkor region's World Heritage-listed temple and other attractions. On the 5th (Sun), delve into the distant past at Angkor Thom, delve into the distant past at Ta Prohm, and then delve into the distant past at Angkor Wat. Get ready for a full day of sightseeing on the 6th (Mon): view the masterpieces at One Eleven Gallery, explore the ancient world of Bayon Temple, and then delve into the distant past at Terrace of the Leper King. For photos, where to stay, more things to do, and more tourist information, go to the Siem Reap trip maker app . Getting from Patong to Siem Reap by combination of taxi and flight takes about 2.5 hours. Other options: drive; or take a bus. Traveling from Patong in May, expect nights in Siem Reap to be about the same, around 31°C, while days are a bit warmer, around 41°C. Finish your sightseeing early on the 6th (Mon) so you can travel to Boracay. All of 7 km (4.3 mi) long, the island of Boracay remains an idyllic destination drawing beach-goers from around the world. 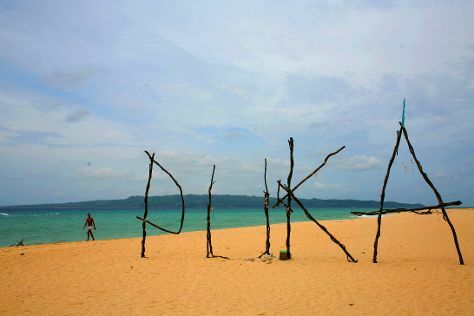 Kick off your visit on the 7th (Tue): stroll through Diniwid Beach, stroll through Yapak Beach (Puka Shell Beach), and then enjoy the sand and surf at White Beach. Keep things going the next day: kick back and relax at Bulabog Beach, kick back and relax at Balinghai Beach, and then enjoy the sand and surf at Ilig Iligan Beach. To find ratings, reviews, photos, and tourist information, use the Boracay trip planner . You can do a combination of flight and ferry from Siem Reap to Boracay in 10 hours. Alternatively, you can do a combination of flight, bus, and ferry. The time zone difference when traveling from Siem Reap to Boracay is 1 hour. Traveling from Siem Reap in May, you will find days in Boracay are a bit cooler (36°C), and nights are about the same (30°C). Cap off your sightseeing on the 8th (Wed) early enough to travel back home.